Hey…”great” job, Idiots. Declare independence from a state then turn right around and set up a new state which turns out to be far worse than the relatively weak state you rejected. When you finally get rid of a tapeworm you don’t rush out to swallow another one. Well, not unless you’re an utter moron. 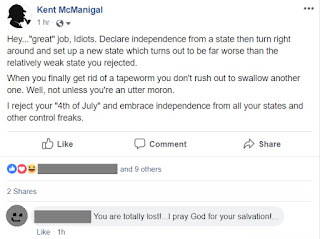 I reject your “4th of July” and embrace independence from all your states and other control freaks. 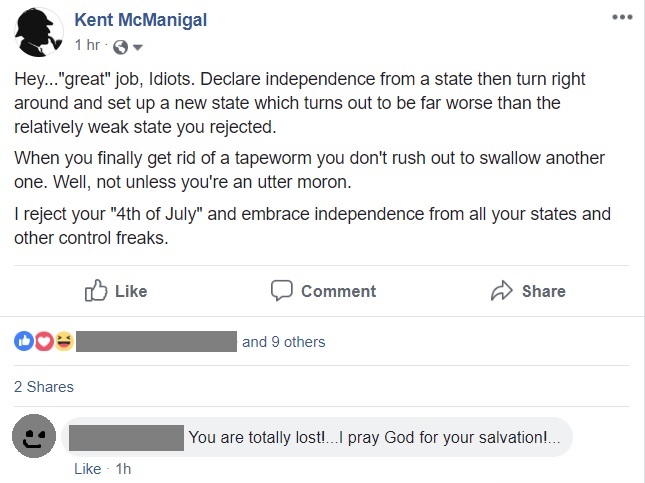 You are totally lost!…I pray God for your salvation!. I find it interesting how some people tend to conflate their gods; confused over which one I’m not properly worshiping this time.